Turtles are likely to be especially cautious when they’re out of their usual habitat. They struggle with transitions and changes, so don’t be surprised or critical of your child. Your Turtle may get nervous or worried, so help her feel a part of the process by adapting the plan — together — when you’re on the go. Assure your Turtle that you will stick to the routine that you’ve established, but that you may need to add some steps, like finding the bathroom. Make sure to bring her favorite potty time book, special potty toys, and use the Time to Potty app just like at home. It’s especially important to allow your child to choose his Pull-Ups training pants when you are out and about, even if he's regularly busting out the Big Kid underwear. Allowing that extra protection and the control of choice can give your Turtle the comfort and confidence he needs to be successful. Make sure you have your Turtle’s favorites, whether it’s the special potty seat you always use, or the right character Pull-Ups. A trip is not the time to improvise when it comes to the Turtle personality. Let your Turtle know you’ve packed extra clothes and other items she may need. Your reassurance that you’re prepared will go a long way. Turtles may be scared of an automatic flusher because it’s loud and unpredictable. (Even us adults don’t enjoy having an unexpected spritz when we’re doing our business.) Carry some sticky notes in your bag and place one over the sensor while your Turtle is on the potty. When she’s done, she can take the sticky note off and have control over the flusher. When you’re on longer trips, give your child the option to wear Pull-Ups even if he’s regularly in underpants. 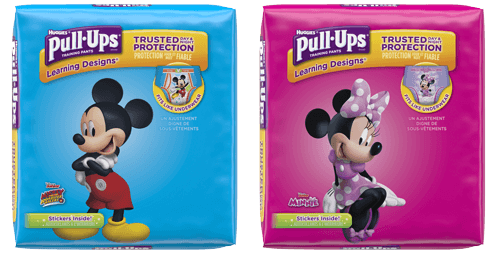 A child who is sometimes in underwear but who will be going on a long trip might do best wearing Pull-Ups. Explain by saying, “Things are going to be different today, and sometimes we won’t be able to get to a potty fast enough.” However, a child who regularly wears undies might feel insulted by having to wear Pull-Ups again. For these children, you might bring some Pull-Ups along and have them handy just in case they’re needed during the trip. Regardless of your child’s choice and the stress of travel, try to keep your potty times as positive experiences your Turtle can rely on.